We’ve all heard plenty about the diamond-crusted bike lanes of Copenhagen and Amsterdam, but there are Bike Commuters in every country: from Krygyzstan, France, Japan, Portugal, to Mexico! Ever since last year’s renegade DIY bike lane campaign in Mexico, Mr. Blue Jay on my shoulder has been hinting at a full-scale “Bike Revolution” for our southerly neighbors. The quotation marks in the title and opening sentence of this post are mos DEF finger quotes, in case you were wondering. Hipster Globalization - image from Chihuahua en Bicicleta. Sometimes, us Norteamericanas just can't help from grabbing some weapons before jumping on our bikes! Since the closest I’ve ever been to Mexico City is this Del Taco in San Diego, I will rely on the BBC to relay the ¿Que Paso? (yay for upside-down punctuation!) with their article titled Mexico City’s Bike Revolution. Sunday Fundays in Mexico City: no cars allowed! The strategy is to get 'em hooked on Sundays, so they'll want to commute M-F! Families riding bikes, children on roller skates and barely a car in sight; it’s hard to believe this is usually one of the busiest roads in Mexico City. 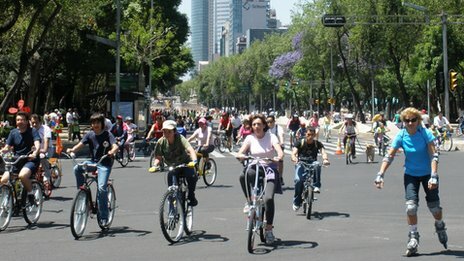 The Reforma’s closure to car traffic on Sundays in 2007 kickstarted the capital’s attempts to make life easier for cyclists. In 2010 a 17km-long bike lane through the city opened – and more efforts to promote pedal power are being unveiled in the coming few months. Chicago’s Metropolitan Planning Council had a chance to visit this year to discover the successes of Mexico City’s transit and cycling initiatives; see details of the encounter comparing Mexico City’s transit plans to Chicago’s in this post from The Connector. The popularity of the EcoBici system is unfounded in Mexico… could this be the “Bike Revolution” bloggers have been predicting? Mexico City’s system, EcoBici, debuted in 2010 in the trendy Condesa neighborhood. It was quickly expanded down the wide, skyscraper-lined Avenida de la Reforma to connect Condesa with the Zocalo (main square) and the historic center of the city. The system was instantly popular, not only in the morning and evening rush hours, but also at midday, when many office workers now elect to ride to lunch. For a short time, demand exceeded supply and there was a waiting list to become a member. EcoBici now has 90 stations and 1,200 bikes, plenty to meet the current demand from its 24,000 members (who take some 9,000 trips every day). It will soon expand to cover two more neighborhoods, with 275 total stations and nearly 4,000 bikes. When that expansion is completed later this year, EcoBici expects to serve 73,000 users and 27,500 trips every day. In 2010, the city passed a package of bike-friendly laws. Most prominently, Mexico City repealed its mandatory helmet law on the grounds that it was discouraging cycling and leaving everyone in greater danger. “It’s safer for them to cycle, whether they have a helmet or not,” argued Montiel. At the same time, Mexico City reduced speed limits in areas with traffic calming or heavy pedestrian traffic and hiked up the penalty for driving or parking in a bike lane. Though cycling has made significant strides over the last five years, its position in Mexico City is hardly assured. Last year, a prominent radio host, Angel Verdugo, called on his afternoon listeners to “crush” the “red plague” of cyclists — to literally run them over. Verdugo was fired, but the moment revealed the ferocity of anti-cycling sentiment that seems to persist in some quarters of the city. The political winds could shift after Mayor Ebrard leaves office this year. “It’s an election year,” he said, “so we have to complete every project in the city, for Ecobici, for the bike lanes.” Some of the candidates for mayor this year, he implied, might not be so bike-friendly. I guess the traffic-congested “mean streets” of Mexico City, and A-hole radio personalities will just add fuel to the flames as transportation cycling continues to pick up in Mexico. Full blown Bike Revolution? Maybe… in the meantime, the progress is commendable! I want Sunday traffic shutdowns in my city! Pedal forward… Cycle Ladies & Gents. Adios! Where are these “diamond-crusted bike lanes?” I’m feeling poor today. Would a multi-tool suffice to snap off a few in order to fund my trip and my next bike? “Self-crowned exaggeration queen” indeed! Exaggerating or not, Mir.I.Am notes an important point – Mexico City had the courage to repeal its mandatory helmet law to help this work. When I asked whether Dallas might follow Mexico’s example – to a local bureaucrat who shall remain nameless, the response was “they’d NEVER do that.” Well, that is one reason more why, though I ride every day in the DFW Metroplex, I tend to avoid riding in – DALLAS. And yes, I do wear a helmet, but I am offended by anti-cycling measures such as the baseless Dallas helmet law. Instead, I go to Fort Worth. Besides, Starbucks is cheaper in Fort Worth than in Dallas. @Steve A – I will save you some diamonds next time I’m over there! In Honolulu, helmets are optional for cyclists, mopeds, & motorcycles… believe it or not!